Hard cooked eggs are perfect for many salads, appetizers and main dish recipes. Soft cooked eggs make a good breakfast or light lunch or supper meal. Both are easy to make, and also easy to goof up. Eggs cooked in the shell should be cooked over high heat just until the water boils, then removed and left to stand for the doneness desired. 1. The most common method is to put the eggs in a pan with enough room to hold them without crowding, with cold water to cover by at least an inch. 2. Over high heat, heat water and eggs until just fully boiling. 4. Pour off the hot water and run cold water over the eggs to stop cooking and make peeling the hot eggs easier if they are to be served hot. The idea is to have eggs where the yolks are cooked completely if they are to be served hard-cooked, but without the unattractive greenish gray cast that overcooked yolks get. Soft cooked eggs have a barely cooked yolk and a completely opaque white that is still soft. Times for cooking your eggs may vary depending on how cold the eggs were when you started. I always set mine out ahead of time to come to room temperature. You can bring them to room temp quicker by placing them in lukewarm water for a few minutes, which is what the egg board recommends. Very fresh eggs don’t peel as well; you may want to use your oldest eggs or purchase them ahead of time. 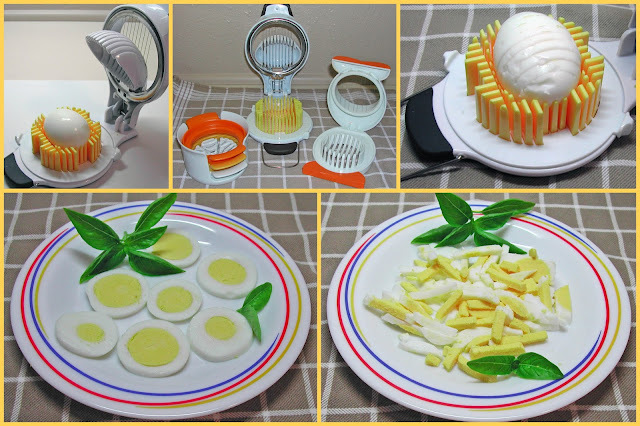 One of the ways to have attractive sliced hard cooked eggs is to use a egg slicer. They range in price from very cheap to around ten dollars. In the photo the slicer on the left, Sue’s, will cut 6 wedges, or halve or slice an egg, the one in the middle which is mine will slice and chop an egg and the one on the right which is my daughters will just slice, which is the most common kind. They are not necessary to own, but really make great looking eggs for when you want that dish you are making to look special. Notice the nice size of Sue’s and that it takes up very little space in your drawer. I also now own one like that; kitchen tools being one of my weaknesses.